As one of the most severe urban droughts in modern history, the Cape Town water crisis has flooded South African and international news in recent months. For Finnish, please scroll down. After an unprecedented three-year drought, the city is set to meet ‘Day Zero’ by August 2018, with implications for public water access, agriculture, and industry. Although current conservation efforts could mean that Day Zero will be avoided, there are useful lessons the Cape Town experience can offer for effective drought management for other vulnerable cities across the world. However, there are also complex political, social and infrastructural factors at play – factors which are rarely examined by the media.2 In this article, I will explain how hydropolitics and power have driven the water crisis, as well as how these factors have shaped perceptions, impacts, and responses. I will then suggest how political decision-making and narratives surrounding the crisis can be challenged in the hope of dealing with water crises better in the future. ‘Politics’ refers to the activities associated with the governance of a country, especially the debate between parties over power and ‘who gets what, when, where and why’.3 Hydropolitics subsequently refers to the politics affected by the availability of water and water resources, and vice versa. Power impacts the game of hydropolitics directly and indirectly, and can be utilised tacitly through approaches such as economic strategising and blame shifting, so that actors can get what they want. To understand how hydropolitical interactions have contributed to Cape Town’s water crisis, it is important to understand how water is governed in South Africa. First, water allocations and major infrastructure are the responsibility of the national government. Legislative processes, including the 1998 National Water Act, the 1997 Water Services Act, and the Water Service Regulations and National Water Resources Strategy, act as a legal foundation for regulatory processes in the country. Nine provinces then provide oversight and support, under which metropolitan and district municipalities manage supply systems for water delivery. Although the legislation is designed to coordinate the three-tiered framework, implementing the ambitious legislation has been problematic due to the lack of recognition of the complex historical context and associated inequalities in knowledge, power and water access in the post-apartheid era of South Africa.4,5 Uncertainty and incoherence in water-related policy and legislation compound these issues. The interplay of South African politics with environmental factors has led to a ‘perfect storm’ in Cape Town (Figure 1). The combination of significant population growth, limited government resources and corruption undermining infrastructure investments, the misallocation of water – plus an unprecedented three-year drought – have all contributed to the water crisis. Power asymmetries and collective action problems impacted many of the social aspects of the Cape Town ‘storm’. For example, just 5% of the city’s water is allocated to over 20% of the population in informal settlements6, indicating disproportionate access to water across classes. Likewise, although the narrative of a collective crisis has now encouraged households to take action, individuals were slow to voluntarily adopt conservation behaviours. These factors, coupled with a lack of strict regulation by local authorities, exacerbated the crisis. More broadly, there is concurrently a clear ‘blame game’ occurring amongst government officials, which is shifting resources away from crisis management. The blame game is a textbook political strategy for dealing with complex situations, and a way for politicians to manipulate narratives surrounding an issue. In South Africa, numerous politicians have declared the drought a consequence of climate change. While there is some merit in this explanation, as shown by CSAG’s data, blaming an indirect cause such as the environment for the crisis alleviates the need for politicians to take responsibility for their own political failings. National-level politicians have also been engaging in tense disputes with both the provincial and municipal government in the Western Cape regarding responsibilities and water crisis funding for several years. This is not unexpected; both the Western Cape Province and City of Cape Town municipality are run by the main opposition party, the Democratic Alliance (DA), while the remaining eight provinces and national government, are led by the African National Congress (ANC). This complicates the political sphere. Similarly, in late 2015, the Western Cape provincial government applied to the national government for funding for water supply strategies, such as water recycling, and to declare the Western Cape a drought disaster area. Although the claim was initially rejected due to high dam levels7, the national government was eventually forced to declare five municipalities within the Western Cape disaster areas. The national government prolonged the process, however, with applications to declare the City of Cape Town a disaster area still being rejected as late as February 2017. By avoiding declarations of disaster areas and shifting responsibility to the Western Province and City of Cape Town municipality, the national government was able to avoid drought relief funding. This type of financial mismanagement and corruption has been commonplace. For example, allegations against the Department of Water and Sanitation (DWS) are abundant, with public records indicating over R100million of overspending by the department in 2016-17.8 Interestingly, much of this was attributed to unforeseen drought relief expenditure, despite DWS declaring that no amount allocated for the Western Cape’s drought relief in 2017-18. Blame shifting has also occurred in other interactions: a very public dispute between the Premier of the Western Cape (provincial level) and the South African Weather Service over climate model interpretations indicates an underlying issue at the science-policy interface.9 This highlights deeper issues around how science is, and can be, integrated into policy-making, and how scientists can communicate evidence-based arguments to politicians and the media more effectively. Figure 2. Cape Town is facing its worst water crisis in modern history. Image supplied by author. Both the scientific community and the public’s response to the drought have the potential to challenge conflicting narratives around water management in South Africa. There is clear evidence that the scientific community first called for increased governmental coordination and focus on drought preparedness over ten years ago.13,14 Yet, such calls were not integrated into drought preparedness, and limited knowledge and understanding of climate issues across all levels of government have continued to hinder drought responses. This suggests that in the face of a water crisis, scientists and politicians need to communicate more effectively – scientists must stipulate the policy relevance of their findings, while politicians must engage and listen to the scientific evidence. It is clear that Cape Town’s problems were driven not only by an unusual meteorological event, but also ongoing political incompetence and mismanagement across all levels of governance. To avoid a repeat of the Cape Town crisis, politicians must begin to actively engage with the scientific community regarding drought preparedness, and work towards more transparent monetary decisions. Similarly, the public can play a role through challenging the status quo and encouraging government officials to take drought preparations more seriously. South Africans must take advantage of the current momentum surrounding the water crisis to ensure that the national government sufficiently plans for, and funds, drought strategies for the future. Much has been said about the need for investment in alternative water supplies, and to increase water-use efficiency. However, cities such as Cape Town must ask important economic questions: what price are residents able, and willing, to pay for such technologies, and how much is the government expected to fund? With a government already struggling to balance its cheque-book it is difficult to see how it can subsidise expensive supply-side options in its current state. Even more worrying is how the cost of such efforts would be distributed across the unequal society living within Cape Town’s borders. Drought in countries such as South Africa is inevitable. Indeed, long before the current crisis, Cape Town was identified by the national government as having the potential to be the first major urban region in the country where water demand could exceed supply if economic, population, and climate projections manifested.14 Yet, what is not inevitable is the development of a crisis at the level witnessed in Cape Town. What the Cape Town crisis shows is that preparing for drought requires a team effort – evidence-based science, pressure from the public, and political will. Cape Town’s perfect storm was driven by the mismanagement of funds and a lack of political will, coupled with environmental factors, which all contributed to one of the most severe urban droughts in modern history. Yet, Cape Town’s water crisis is not an isolated event; many other cities around the world have similar potential to face such predicaments if they do not adequately prepare. For these other cities, it is important to remember that it is the decisions made, and resources allocated, that determine whether they can cope with drought events – and that such decisions are driven by politics and power, not meteorology. Amy Fallon is a PhD candidate at Aalto University’s Water and Development Group in Helsinki, Finland. She holds an MSc in Water Security and International Development, and a BSc in Environmental Sciences, both from the University of East Anglia (UK). Her doctoral research focuses on resilience-based approaches to water governance in dynamic river basins, with current focus on Cambodia’s Tonle Sap Lake. Prior to her PhD, she worked as part of the Southern Africa’s Hydro-Economy and Water Security (SAHEWS) project in South Africa, looking at the use of seasonal forecasts in groundwater agriculture. This text was originally published in Global Water Forum. Kuluva vuosi on ollut ympäristön ääri-ilmiöiden kannalta merkittävä. Etelä-Afrikan Kapkaupungin vesikriisi on historiallisesti yksi kaupunkialueiden pahimmista kuivuuksista ja siitä on uutisoitu runsaasti. Odottamaton, kolmeksi vuodeksi venynyt kuivuusjakso voi ajaa kaupungin tilanteeseen, jossa vesi on yksinkertaisesti loppu. Voimme vain kuvitella tällaisen vaikutuksia vesihuoltoon, maatalouteen ja teollisuuteen. Kapkaupungin tilanne opettaakin muille kaupungeille paljon toimivasta kuivuudenhallinnasta. Kriisin taustalla on erityisesti ympäristötekijöitä, kuten kolmen vuoden (2015-2017) pitkä kuivuusjakso. Lisäksi Kapkaupungin yliopiston ilmastojärjestelmien tutkimusryhmä (CSAG) on havainnut alueen sademäärissä jatkuvan pienenemisen viimeisten 84 vuoden aikana, indikoiden ihmisen aiheuttaman ilmastonmuutoksen lisäävän kuivuutta alueella. Tilanteeseen vaikuttavat myös monimutkaiset poliittiset, sosiaaliset ja infrastruktuuriin liittyvät tekijät, jotka harvemmin nousevat mediassa esiin. Ryhmämme tohtorikoulutettava Amy Fallon tuntee vesipolitiikan ja vallan merkityksen vesikriiseihin. Vesipolitiikalla tarkoitetaan kaikkia niitä hallinnollisia toimia, joilla on vaikutusta veteen ja vesivaroihin. Valta vaikuttaa vesipolitiikkaan eri lähestymistapojen, kuten taloudellisen strategioinnin ja syyttelyn kautta – näin toimijat saavat haluamansa helpommin. Miten vesivaroja hallitaan Etelä-Afrikassa? Kansallinen hallitus vastaa vedenjakelusta ja suuresta infrasta ja oikeudellinen perusta tulee lainsäädännöstä. Yhdeksän maakuntaa vastaavat valvonnasta ja tuesta. Todellisuudessa kunnianhimoisen lainsäädännön toteuttaminen on ollut haastavaa johtuen valtion Apartheid-historiasta ja vallitsevasta epätasa-arvosta liittyen tietoon, valtaan ja veden saavutettavuuteen. Vesipolitiikkaan ja lainsäädäntöön liittyvä epävarmuus ja epäyhtenäisyys yhdistävät nämä kysymykset. Etelä-Afrikan politiikan ja ympäristötekijöiden yhteisvaikutuksesta alueelle on syntynyt ”täydellinen myrsky” (ks. kuva 2). Vesikriisin taustaulla ovat väestönkasvu, rajallinen hallinto, korruption heikentämät infrastruktuuri-investoinnit sekä epäreilu vesipolitiikka sekä tietysti kolmeksi vuodeksi venynyt kuivuusjakso. Vallan epäsymmetria on selkeä: 5% Kapkaupungin vesivaroista on ohjattu epävirallisten asumusten asukkaille, jotka ovat yli 20% kaupungin väestöstä. Vaikka vesikriisi on paljon keskustelu ongelma, yksilöiden on ollut hidasta vapaaehtoisesti omaksua vettä säästävä arki. Kun tähän summataan tehokkaan säännöstelyn puuttuminen, on kriisi päivänselvä. Kuva 2. Kapkaupungin myrsky on monen tekijän summa. Myrsky on aiheuttanut valtionjohdon ja hallituksen keskuudessa keskinäistä syyttelyä, joka on vienyt aikaa ja resursseja pois kriisinratkaisusta. Vastuunoton sijaan moni poliitikko on osoittanut tilanteen olevan ilmastonmuutoksen aiheuttama. Syyttäviä sormia on osoiteltu puolin ja toisin myös keskustelussa vastuusta ja kriisinhallinnan rahoituksesta. Valtionhallinnon hidas reagointi kriisien syntyyn siirtää syyttelyä paikallistasolle ja vapauttaa hallituksen myöntämästä varoja paikalliseen kuivuudenhallintaan esimerkiksi Western Capen maakunnassa. Tällainen menettely on alueella valitettavan yleistä. Myös tieteen ja päätöksenteon rajapinnassa kuohuu. Western Capen pääministerin ja Etelä-Afrikan ilmatieteenlaitoksen välinen julkiset tulkinnat ilmastomalleista osoittavat, miten tiede voidaan sisällyttää päätöksentekoon, ja miten tieteilijät voivat kommunikoida näyttöön perustuvin argumentein poliitikoiden kanssa. Sekä tiedeyhteisö että kansalaiset voivat kyseenalaistaa Etelä-Afrikan vesihallinnon ympärillä vellovat ristiriitaiset kertomukset. Tiedeyhteisö peräänkuulutti hallinnon roolia kuivuuteen valmistautumisessa jo vuosikymmen sitten, olkoonkin ettei näitä huomioitu. Tilanne osoittaa, että varsinkin vesikriisin äärellä, tutkijoiden ja poliitikkojen tulisi kommunikoida paremmin – tutkijoiden on osoitettava tulostensa poliittinen relevanssi ja poliitikkojen tulisi keskittyä ja kuulla tieteen näyttämät tulokset. On päivänselvää, ettei Kapkaupungin ongelmat ole yksin sääilmiöiden aiheuttamia, vaan ne juontuvat myös epäpätevästä ja huonosta hallinnosta sen kaikilla tasoilla. Hallinnolta edellytetään jatkossa aktiivisempaa yhteistyötä tutkijoiden kanssa sekä avoimempaa rahoituspolitiikkaa. Yksilöilläkin on mahdollisuus patistaa hallitusta panostamaan kuivuuteen valmistautumiseen. Vuoden 2018 kuivuus on tuhannen taalan paikka kehittää politiikkaa ja hallintoa varautumaan tulevaan paremmin. Koska kehitys tarvitsee myös investointeja vedenjakeluun ja sen tehostamiseen, kysymys on myös asukkaiden valmiudesta ja mahdollisuuksista sijoittaa teknologioihin. Myös hallituksen osuus kuluista täytyy olla selvä. Etelä-Afrikan kaltaisessa maassa kuivuus on väistämätöntä. Jo kauan ennen nykyistä kriisiä hallitus oli tunnistanut Kapkaupungin mahdollisesti ensimmäiseksi kaupunkialueekseen, jossa veden kysyntä ylittäisi tarjonnan. Tapaus osoittaa, että kuivuuteen varautuminen on joukkuelaji, jossa tähtikentän muodostavat havaintoihin perustuva tutkimus, julkinen paine, ja poliittinen tahto. Kapkaupungin tapauksessa kentällä pelasivat huono hallinto, väärin osoitettu rahoitus ja poliittisen tahdon puuttuminen, ympäristötekijöiden rinnalla. Kapkaupunki ei ole ainoa laatuaan, vaan lukuisilla kaupungeilla kautta maailman on riski ajautua samanlaiseen tilanteeseen, jos niissä ei ymmärretä ennakoimisen tärkeyttä. Näille kaupungeille on tärkeää ymmärtää, että tehdyt päätökset ja riittävät resurssit määrittävät mahdollisuudet selviytyä kuivuudesta. Nämä päätökset ovat politiikan ja vallan, ei meteorologian käsissä. Amy Fallon työskentelee ryhmässämme tohtorikoulutettavana. Hän tutkii resilienssiin pohjautuvia lähestymistapoja vesihallintoon monimuotoisilla valuma-alueilla, erityisesti Kambodiassa. Hän on aikaisemmin työskennellyt Eteläisen Afrikan vesi-taloudellisen ja vesiturvallisuuden (SAHEWS) projektissa tarkastellen vuodenaikaisten ennusteiden sovellettavuutta pohjavesiperustaiseen maatalouteen. Laswell, H. (1936). Politics: Who Gets What, When and How. New York: McGraw Hill. Schreiner, B. 2013. Viewpoint – Why has the south African national water act been so difficult to implement? Water Alternatives 6(2): 125 – 131. Denby, K.; Movik, S.; Mehta, L., van Koppen, B. 2016. The ‘trickle down’ of IWRM: A case study of local-level realities in the Inkomati Water Management Area, South Africa. Water Alternatives 9(3): 473-492. Van Koppen, B., Schreiner, B., 2014. Priority General Authorisations in rights-based water use authorisation in South Africa. Water Policy 00: 1-19. Cullis, J. & Van Koppen, B., 2008. Applying the Gini Coefficient to Measure the Distribution of Water Use and Benefits of Water Use in South Africa’s Provinces. Unpublished report. Department of Water Affairs and Forestry and International Water Management Institute, Pretoria. Mukheibir, P., Ziervogel, G., 2007. 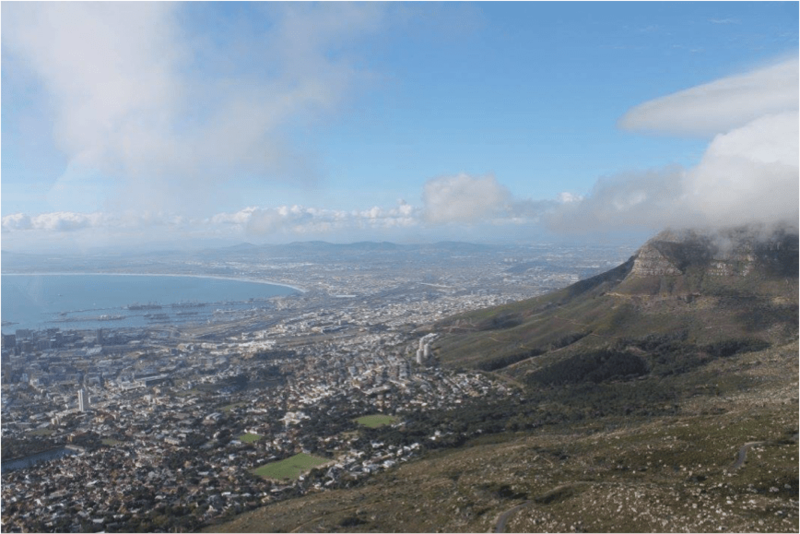 Developing a Municipal Adaptation Plan (MAP) for climate change: the city of Cape Town. Environment and Urbanisation 19(1): 143-158. Ziervogel, G., Shale, M., Du, M., 2011. Climate change adaptation in a developing country context: The case of urban water supply in Cape Town. Climate and Development, 2: 94-110.